The game is played at a neutral site, determined through bids by prospective host cities (similar to the Super Bowl and NCAA Final Four). When announcing it was soliciting bids for the 2016 and 2017 title games, playoff organizers noted that the bids must propose host stadiums with a capacity of at least 65,000 spectators, and cities cannot host both a semi-final game and the title game in the same year. The winner of the game is awarded a new championship trophy instead of the "crystal football", which has been given by the American Football Coaches Association (AFCA) since 1986; officials wanted a new trophy that was unconnected with the previous BCS championship system. The inaugural game was held at AT&T Stadium in Arlington, Texas in January 2015, and was won by Ohio State. The awarded trophy, College Football Playoff National Championship Trophy, is sponsored by Dr Pepper. AT&T Stadium hosted the inaugural College Football Playoff National Championship game, played in January 2015. The number of cities capable of bidding for the event is restricted by the 65,000-seat stadium minimum. In addition to Raymond James Stadium in Tampa, which was the other finalist for the 2015 matchup, the stadium restriction would limit the bidding to cities such as New Orleans, Glendale, and Pasadena. Other possible future hosts include Orlando, San Antonio, and almost any city with a National Football League franchise, since all but three of the stadiums in that league meet the capacity requirements and, unlike the Super Bowl, there is no de jure restriction on climate. Officials in New York City said they would like to host the game at Yankee Stadium, which hosts the annual Pinstripe Bowl, but it falls short of the attendance limit as it only holds approximately 54,000 fans in its football configuration (a game could still be hosted in the New York metropolitan area, but it would have to be at MetLife Stadium in East Rutherford, New Jersey). On December 16, 2013, host selections for the 2016 and 2017 title games were announced. Glendale, Arizona (University of Phoenix Stadium) was selected to host the 2016 game and Tampa, Florida (Raymond James Stadium) was selected to host the 2017 game. Four cities had submitted bids for the 2016 game: Glendale, Jacksonville (EverBank Field), New Orleans (Mercedes-Benz Superdome), and Tampa. Six metropolitan areas had been vying for the 2017 game: Tampa, the San Francisco Bay Area (Levi's Stadium), Minneapolis (U.S. Bank Stadium), San Antonio (Alamodome), South Florida (Hard Rock Stadium), and Jacksonville (Jacksonville Municipal Stadium). The hosts for the 2019 and 2020 games were announced on November 4, 2015. 2019 – Levi's Stadium in the San Francisco Bay Area (Santa Clara, California). 2020 – Mercedes-Benz Superdome in New Orleans. The hosts for the 2021 through 2024 games were announced November 1, 2017. 2021 – Hard Rock Stadium in Miami Gardens, Florida. 2022 – Lucas Oil Stadium in Indianapolis, Indiana. 2023 – Los Angeles Stadium at Hollywood Park in Inglewood, California. 2024 – NRG Stadium in Houston, Texas. Since cities hosting College Football Playoff semifinal games cannot host the championship game in the same year, Pasadena and New Orleans were not eligible for the 2018 game; South Florida and North Texas could not host in 2019; and Glendale and Atlanta were excluded from 2020 consideration. The same exclusions rotate every three years through 2026. For previous championship game results, see BCS National Championship Game (1998–2013), Bowl Alliance (1995–1997), and Bowl Coalition (1992–1994). Rankings are from the CFP Poll released prior to matchup. 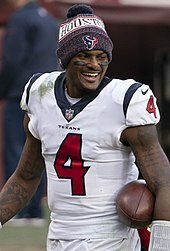 Deshaun Watson was offensive MVP of the January 2017 game. An offensive and defensive MVP is named for each championship game. ^ Wolken, Dan (25 April 2013). "Questions and answers for the College Football Playoff". USA Today. Retrieved 25 April 2013. ^ a b c Jerry Hinnen (August 7, 2013). "CFB playoff opens bidding for 2016, '17 championship games". CBSSports.com. Retrieved August 9, 2013. ^ a b Brett McMurphy (July 26, 2013). "More bids on future title game sites". ESPN.com. Retrieved August 10, 2013. ^ "Arlington to host title game". ESPN. January 7, 2013. Retrieved April 25, 2013. ^ Anthony Crupi (March 25, 2014). "ESPN Inks Dr Pepper as First Mega-Sponsor of the College Football Playoff Series". Adweek. Retrieved April 7, 2014. ^ Chuck Carlton (April 23, 2013). "Sources: Cowboys Stadium to land 2014 college football national title game on Wednesday". Dallas Morning News. Retrieved August 9, 2013. ^ Alex Scarborough (November 4, 2015). "Atlanta, Santa Clara, New Orleans land CFP title games for 2018–20". ESPN.com. Retrieved November 4, 2015. ^ Charlotte Carroll (November 1, 2017). "College Football Playoff Announces Site for 2021-2024 National Championship Games". si.com. Retrieved November 1, 2017. ^ Brett McMurphy (Sep 19, 2013). "Cities to bid on '16, '17 title games". ESPN.com. ^ WVTM, Kyle Burger (2019-01-07). "Announced attendance: 74,814". @KyleWVTM13. Retrieved 2019-01-08. ^ "Trevor Lawrence, Trayvon Mullen earn MVP honors as Clemson blows out Alabama". thestate. Retrieved 2019-01-08.